founded to provide specialist architectural services to the commercial sector. Paul graduated with honours in architecture from Bolton Street D.I.T. in 1998. He practiced in Ireland and Australia and became a member of the RIAI in 2002. After working with Murray O’Laoire, McCullough Mulvin, Kelly Barry O’Brien Whelan and Cox Richardson he set up his private practice in 2004. This was with a view to specialising in PassivHaus architecture. In 2009 Paul earned a Masters degree in architecture with Merit in Advanced Environment and Energy studies. The thesis focused on efficiency aspects of PassivHaus design. Paul is a member of PassivHaus Association. 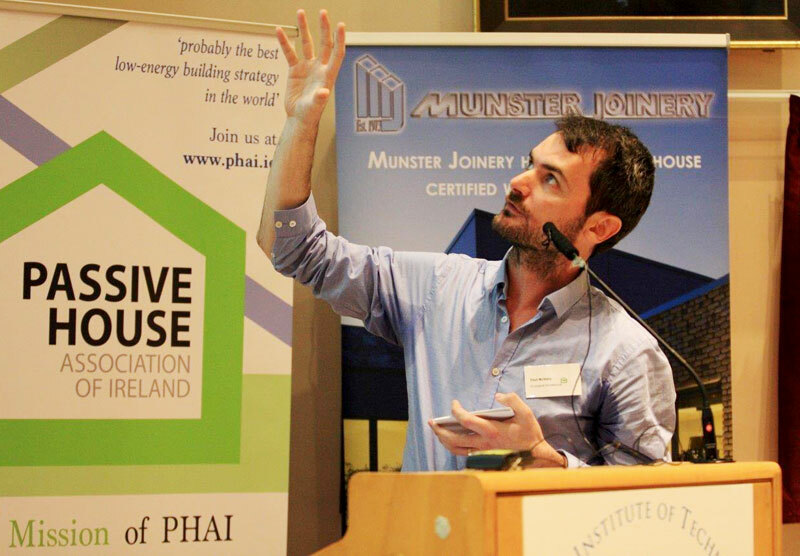 He has presented at the PassivHaus Association of Ireland’s annual conferences. Attended the International PH conferences in Germany and Austria, presented at the North American Passive House Network Conference in New York in 2016 and the Vienna International PassivHaus conference in 2017. Paul is a Certified PassivHaus Designer. What is Nearly Zero Energy Building anyway? Nearly Zero Energy Building (NZEB) is the building standard which will be mandatory for non residential buildings by 2018, by EU Directive. PassivHaus is the most effective way to achieve this legislative standard for most buildings. See our blog post on NZEB here. The practice is one of Ireland’s only architects to have designed and completed both residential and commercial PassivHaus Certified buildings. You are a socially responsible company who takes your ethical standards seriously in everything you do. But when your clients look at where you work, they see twentieth century air conditioning, poorly constructed fabric and it just doesn’t tally with your corporate image. Your company has high rates of absenteeism because your staff are constantly getting colds and headaches or they just don’t feel like coming to work. Imagine a building that worked for you. That was constantly comfortable with superior levels of natural light. It is cheap to heat and cool and it might even be energy positive. The building has constantly filtered fresh air, but not air-conditioned because the building doesn’t over heat as the structure cools itself naturally. Your staff are more productive, because their environment is optimal. Clients and customers can see that you are indeed a socially responsible company which takes your environmental impact seriously and not because you have to, but because you want to. We can make that aspiration a reality. The PassivHaus Architecture Company is a Registered Practice member of the RIAI. The practice has specialist capabilities to design low-energy buildings, Nearly-Zero Energy (NZEB), PassivHaus buildings that are so well designed and built as to not require a conventional heating or cooling system.